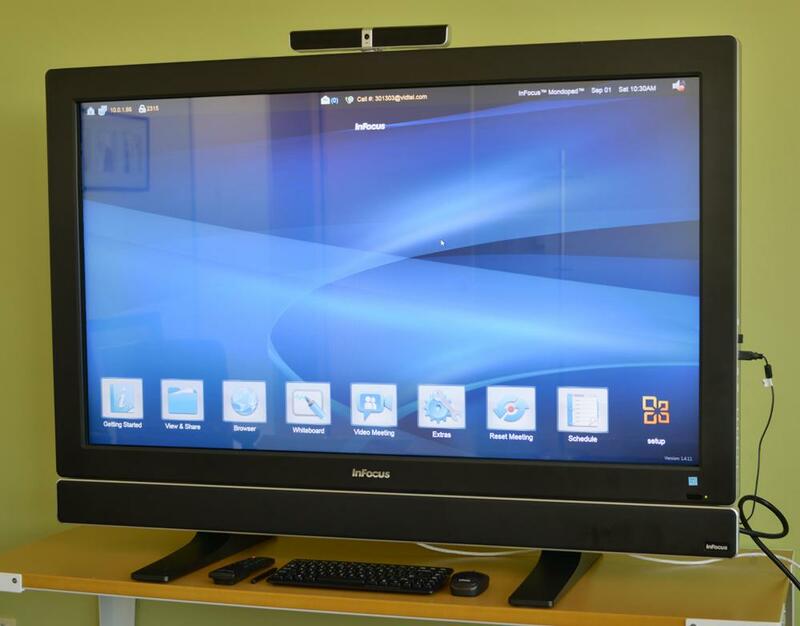 Earlier this year, InFocus introduced the Mondopad, a hybrid television and computer built specifically to conquer the classroom and boardroom. Like Sharp’s competing Aquos Board, this all-in-wonder machine promises to make “presentation, annotation and collaboration” easier than ever before with video, drawing and even multitouch capability. 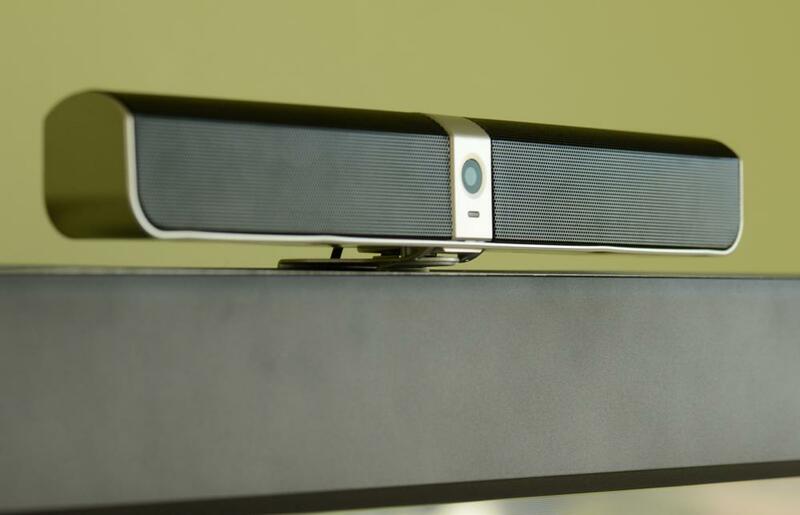 Recently, the Wilsonville, OR-based company came by Digital Trends HQ and dropped one of for us to play around with. We played around with it and offer our impressions below. The Mondopad is big. Take that concept you have of a flat-screen TV and toss it right out the window. The Mondopad measures 38.3 x 53 x 5.5 (H x W x D-in inches) and weighs 96.5 lbs. Wrangling the Mondopad from its box is a two- or three-person job, to be sure. You can wall-mount the Mondopad (very carefully) but it comes with two large “feet” that fit up and into the bottom of the cabinet to act as a stand. 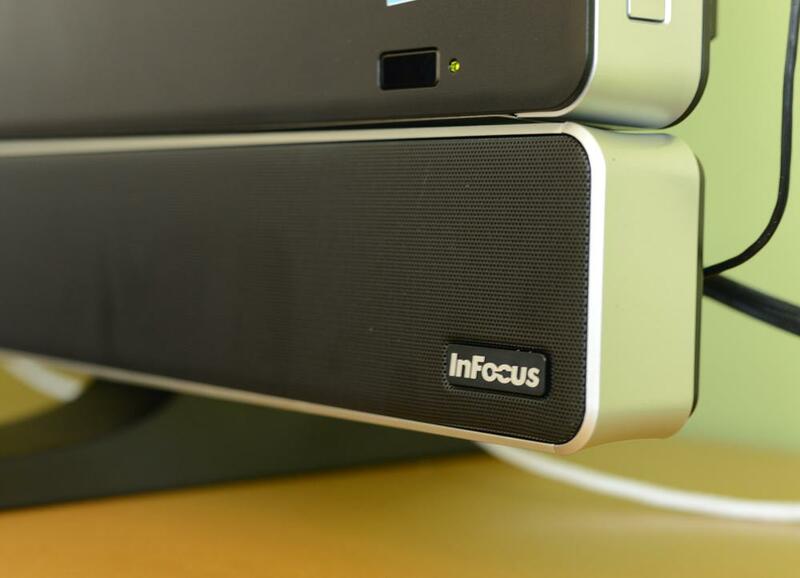 If you want to use your own audio system, you can, but InFocus includes its own self-amplified sound bar, which mounts directly under the screen. It uses two 3-inch drivers and a ¾-inch tweeter on the far left and right sides and houses a 25 watt-per-channel amplifier as well. Also in the box is a 720p webcam and microphone array for video conferencing, a wireless mouse and keyboard and a stylus. To be frank, we’re not fans of the name. This is for a couple of reasons: First, Mondopad just sounds funny. The name got more than a few chuckles around our office during the few weeks the device was in residence. Second, the name implies that the device is a monster-sized tablet — and it isn’t, despite the fact that a great deal of the press seems to have bought into that notion. Sure, thinking of the Mondopad as a tablet brings to mind a simple interface with touchscreen capability — that’s probably a good thing for InFocus’ marketing department — but to refer to the Mondopad as a tablet seems misleading and inaccurate, because it is so much more than that. Under the hood of this tank is a full-fledged PC running on Windows 7 Pro, a 2.5GHz Core i5 processor, 4GB of RAM, a 250GB hard drive and Intel HD Graphics. It also features six USB A ports, a USB B port, two Ethernet jacks, built-in Wi-Fi, two HDMI inputs, S-Video, component and VGA inputs, and comes with a wireless mouse and keyboard. Does that sound like any tablet you’ve ever heard of? We understand that “touch-screen PC” doesn’t sound as good, but let’s call it what it is. If a PC can do it, the Mondopad can do it. But in addition to basic PC functionality, the Mondopad supports easy presentations, document annotations and video conferencing thanks to a sensitive touch-screen, built-in whiteboard, web camera and customized user interface (shell). When you boot up the Mondopad, you are greeted with a home screen with nine icons (which InFocus calls apps) lining the bottom. The “getting started” icon takes you to a brief tutorial, “view and share” pulls up a folder where Mondopad-related files are stored, “browser” pulls up an Internet Explorer window without needing to leave the Mondopad interface, “white board” is self-explanatory, “Video Meeting” pulls up an interface to access VidTel’s cloud-based service for video conferencing, “extras” allows access to some common Windows functions (like the control panel) without having to leave the Mondopad shell, “reset meeting” closes all files, whiteboards and video meetings and the “schedule” icon will bring up a daily calendar. Video conferencing through VidTel allows almost anyone to join in a virtual meeting, whether they use VidTel or another service like Skype, GoToMeeting, webex or Google Talk. If you don’t want to run a full-on video meeting, you can simply share your whiteboard through a password protected IP address and make a conference call. When you’re done with your presentation, you can email everything you did directly from the Mondopad. The Mondopad connect app takes sharing and control a step further by allowing its screen to be shared with mobile devices and tablets (iOS and Android apps available) or, conversely, the Mondopad can have content shared to it, or even relinquish control to a mobile device. This takes place via Wi-Fi, and since the Mondopad acts as its own Wi-Fi hotspot, clients need only log into the Mondopad as an access point to get started. The InFocus home screen skin keeps things looking and feeling simple, but it is possible to leave the Mondopad’s shell and work directly from Windows 7 Pro. The route out of the shell and onto the Windows 7 desktop isn’t readily apparent, nor is the process easy to memorize. We found ourselves hunting and pecking for the way out. We always found it, but only after a couple of minutes. We did have a little trouble using VidTel initially. We found most of the instructions on how to use the service at VidTel’s website, but even after attempting setup ourselves, we were unable to have colleagues dial in remotely using non-VidTel applications such as Skype. One of the advantages to VidTel is that it is a cloud-based service and, using its “MeetMe” service, coordinates video conferencing from multiple channels like Skype and Google Talk. All we wanted was to give someone a number or email to “dial” and that seemed like a lot of work. Ultimately, we ended up launching Skype from Windows and used that as our teleconferencing platform. That worked relatively well, save a few disconnects which we blame on our own network issues. To be fair, we were able to successfully dial into InFocus’ support team using VidTel and the experience was smooth and simple. 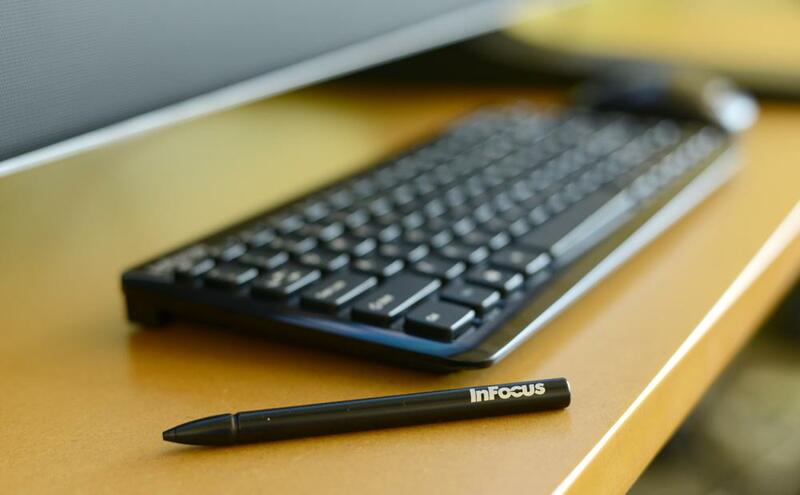 We received outstanding customer support from InFocus any time we needed it, getting succinct answers to our questions and, when needed, had our Mondopad remotely controlled by the support staff for quick and easy solutions to our problems. With all of that said, we think that anyone interested in purchasing and using the Mondopad should ensure the dealer selling it to them is prepared to provide some level of introductory instruction to get them up and running unless they have a competent IT guru on hand prepared to jump into the Mondopad head first. Even a 30-minute instructional session could save hours of trial-and-error and the accompanying frustration of learning a new, complex tool. We were particularly impressed with the included webcam and microphone. 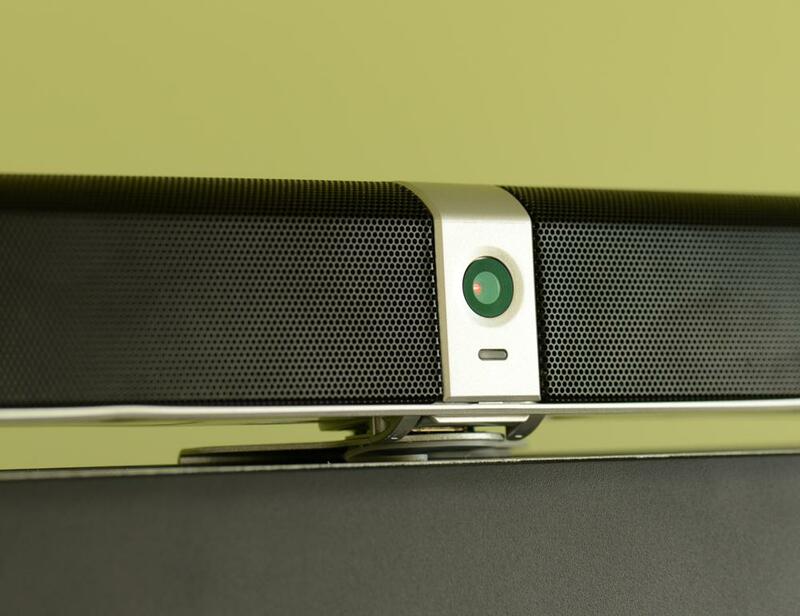 The camera’s angle is wide enough that it was able to cover our entire boardroom and the sensitive microphone delivered crystal-clear audio that rivaled that of our expensive Polycom conferencing phone. We found the Mondopad’s 55-inch screen made a spectacular TV screen as well. Brightness, contrast, black level and shadow detail were all excellent. In a media room setting, the Mondopad would be great for watching movies and sports. There is no doubt in our minds that businesses and educators could benefit greatly from a device like the Mondopad. With it, the distance learning experience could significantly be enhanced. We envision classrooms in the US connected with classrooms in Japan, sharing information in new and exciting ways. We can just see rows of students with iPads contributing to lessons from their seats, and then taking the whole thing home with them to study. This is the sort of futuristic, Jetsons-style technology we’ve been waiting over 50 years for. But while we have no doubts the Mondopad is ready to take on the world, we’re not so sure the world is ready to take on the Mondopad. There are still some who need convincing when it comes to the idea that digital textbooks are superior to paper texts, never mind the notion that a 55-inch HDTV should replace a chalkboard or a whiteboard and toxic-smelling markers. But we have to start somewhere and we applaud InFocus for leading the way.